Sasha Jackson Mysteries : Thoughts on the new "Spenser" mystery by Ace Atkins. Thoughts on the new "Spenser" mystery by Ace Atkins. Let me begin by saying that, YES, I enjoyed it. Action, suspense, I liked the client/kid (Mattie), I was happy to see Hawk return (he was pretty much absent in the last two Spenser installments by Robert B. Parker), there were some clever quips and all the other good stuff that makes a Spenser novel a good read. But but but... This is a Spenser book by Ace Atkins (congrats on the new job, man! ), not by Parker himself. You just know that fans and critics will be ready to pounce if Atkins doesn't measure up. Not to worry: He does. 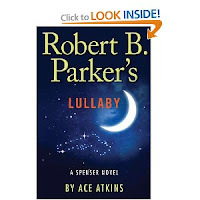 A reader almost... almost couldn't tell the difference between an Atkins Spenser novel and a Parker Spenser novel. There were four things I noticed in the Atkins book that were just a tad different from a Parker book. 2 - Swearing: It seems to me that earlier Spenser books had a few four letter words, but Lullaby seemed to have quite a few, and they usually began with F or with motherf... I am not a prude - it was just something I noticed. 3 - Music references: I liked this! References to musicians or to song titles were minimal in the Parker Spenser novels. Atkins changes this and it's a good thing (in my opinion). Bluesy-Jazz, yeah baby! 4 - Spenser's Roots: One of the alluring things about Spenser is his mysterious past. Readers of the series know that he's from Laramie, Wyoming, and know that his uncles played a major role in his early life. Readers are told almost zilch about Spenser's mom and dad. Atkins doesn't necessarily provide new details or fill in the blanks of Spenser's past, but the mentions of his roots are more frequent than with Parker. In more than one Parker novel, there is no mention at all of Spenser's childhood, so to have 4 or 5 in Lullaby seems like a lot. I would like to see Atkins do another Spenser novel. And I'd like him to write in a scene where the willowy, ethereal Dr. Susan Silverman gets accidentally run over by a bus. That's a change I'd like to see! Great blog and just followed. Would you like to return the favour?